Overall, Hiccups skews toward a sense of visual saturation: gauzy washes of color rush the edges of nearly every sheet, interrupted by modular pieces of cloth and ribbon that have been stitched or glued onto the paper. The content layered upon each panel assumes the qualities of the handmade paper, the attached pieces of fabric, or sometimes both, resulting in an engrossing depth of manifold texture, patterned fabric, and ghostly transferred imagery. 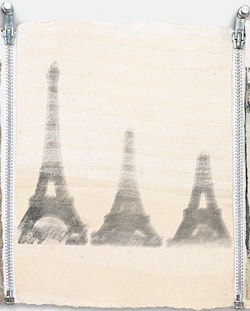 Each roughly hewn page prompts questions about scale, compositional balance, or facture: Why, for instance—as with a solvent transfer of a translucent pea pod, bathed in a hazy, amber gouache (or that of an aerial map of a city, or a picture of construction cranes, and so on)—did Rauschenberg render some images at full bleed, interrupted only by the uneven borders of the paper, while elsewhere images of Eiffel Towers (fig. 2) (or Joe DiMaggios, or lime wedges, or Eadweard Muybridge motion studies) are cropped and grounded within the larger field of the page? Although each panel invites scrutiny, to linger at such an intimate register would be to miss the sweeping breadth of content and ambitious material scale that is the greater point of the work. Since relatively few exhibition spaces can accommodate such an expansive display, the zipped sheets frequently wrap around several gallery walls (pausing only at corners and doorways), enveloping the viewer in a sweep of quintessential Rauschenbergian imagery, rhythmically interrupted by silver-colored stripes of metallic teeth at regular intervals. The success, which is to say, the phenomenological impact (and dare one add, sheer beauty?) of Hiccups therefore hovers in the tension between these two modes of viewing: the pleasurable scopic consumption of a vista of colors and textures from across the gallery (fig. 3), alternated with immersion in a level of subtle detail discernible only through close examination of both the panels and the zippers that unite them, devices which—at least metaphorically—invite touch and manipulation. Beyond its simultaneous visual and haptic appeal, Hiccups prompts a number of questions about its status as an archive and its role within a broader historical context of artistic strategies whose processes involve collecting large amounts of information (cultural details, images, found materials, etc.). In associating and arranging such materials in new ways, the work underscores a modern cultural sensibility that is structured by images, commercial or otherwise. To this end, Rauschenberg’s radical blending of diverse source imagery finds morphological precedent in projects whose sprawling visual vocabularies and expansive structures both embody and radically subvert the modernist archive3—most notably Aby Warburg’s (1866–1929) Mnemosyne-Atlas (fig. 4) and Walter Benjamin’s (1892–1940) Passagen-Werk (The Arcades Project). These two projects, both dating to the 1920s and central to our understanding of how the historical avant-garde appropriated and reused imagery, rightly have come to shape critical discussion of the ways in which archival practices have informed artistic strategies throughout the twentieth century. It is important to understand how Rauschenberg’s project resembles them, but ultimately moves beyond their logic. Although the expansive physical structures of the Mnemosyne-Atlas and Benjamin’s materialist history of the nineteenth-century Parisian commercial arcades inevitably suggest a panoramic sensibility, it is important to our interpretation of Hiccups—not as a seamless vista of images but, through the work of the zippers, as a series of interruptions—to note that both Warburg and Benjamin strenuously avoided such an association. A device of fancy granting the illusion of “naturalized” historical progression, panoramas promoted a seamless continuity, supposed an unproblematic relationship between past and present, and effaced rather than exposed difference and contradiction. Benjamin was particularly careful to distinguish his project from panoramic display, which, in its commercial proliferation in the second half of the nineteenth century, consisted largely of manipulated photographs, artifice, and lifelike replicas.6 Notably, he asserted that the theory underlying the citation style of the Passagen-Werk “connects most closely with that of montage.”7 The Mnemosyne-Atlas, the Passagen-Werk, and Hiccups all represent a relational way of thinking through correspondence without doing violence to inherent difference, modeling an intellectual and visual construction that is based on constellation rather than linear narrative and that emphasizes disparity while revealing implicit connections. Just as Warburg and Benjamin pushed against the orthodox taxonomic arrangements of their time, the productive visual tension and rhythmic sequencing of Hiccups, made literal through the modular fasteners structuring its display, pushes back against the increasingly seamless continuity of the postwar media-saturated landscape Rauschenberg used as the basis for his imagery. Indeed, Hiccups can be regarded as an endlessly iterative set of what Benjamin called dialectical images, in which the “crystal of the total event” can be discovered “in the analysis of the small, particular moments.”8 It is through these ruptures that Hiccups reaffirms what Brian O’Doherty once described as Rauschenberg’s roving, “vernacular glance.”9 This montage-inspired sensibility, in some ways analogous to Benjamin’s dialectical vision, was intended to replace older ways of seeing. Within this specific genealogy, Hiccups further speaks to the potential for enmeshing or “jamming” images against one another in a fashion that nods to other kinds of media beyond “works on paper,” introducing interruption or feedback within an extendable modular system composed of smaller repeating units. Crucial to this interpretation is the idea that apprehending Hiccups is less, as one might imagine, like browsing a modernist archive or a linearized book of sketches or studies and more like quickly scanning, as Cage once famously pronounced of Rauschenberg’s work, “many television sets working simultaneously all tuned differently.”16 If we liken the logic of Hiccups to jumbled sequences of film leader or, maybe best, to switching television channels (here, the horizontal and vertical play of striped or patterned fabric provocatively doubles as representing feedback, disrupted broadcast, or signal loss), the work shifts decisively beyond the logic of Warburg’s ambiguously defined “iconology of the interval,” foregrounding the ways in which Rauschenberg’s choice of framing structure for his imagery (the continuous zippered sheets of handmade paper) could perhaps be considered in terms of the televisual—and in turn, the obligation actively to apprehend such media despite, and even through, its breaks and shifts. Finally, what of the sly and provocative connections implied by Rauschenberg’s use of the zipper, a mechanical symbol of convenience and desire, to connect each panel of Hiccups? From Aldous Huxley’s discussion of sexual liberation and repression in his 1932 Brave New World to Rita Hayworth’s dress in the 1946 film Gilda to Andy Warhol’s cover for the 1971 Rolling Stones album Sticky Fingers, the device has, since its standardization in 1917, invariably prompted connections between its role as an object to be manipulated and a host of libidinal connotations that accompany its opening or closure. And although these points of reference may help account for the zipper’s cultural legibility, it is Rauschenberg’s use of the fastener as frame, or rather, as a device implying suture or edits, that ultimately structures the viewing experience of Hiccups as much as its sensuous pictorial content. For if its wide-ranging imagery and its potential for endless reorderings and connections signal the artist’s interest in archival strategies and photographic visuality, then the zippers connecting each panel, laid suggestively bare, implicate the junctures between the sheets of handmade paper as sites of articulation and possibility. These devices evoke a touch made visible and—through their infinite potential for rearrangement and their articulation of a set orientation for connection—put forth a kind of gap to which we, as viewers, must attend. 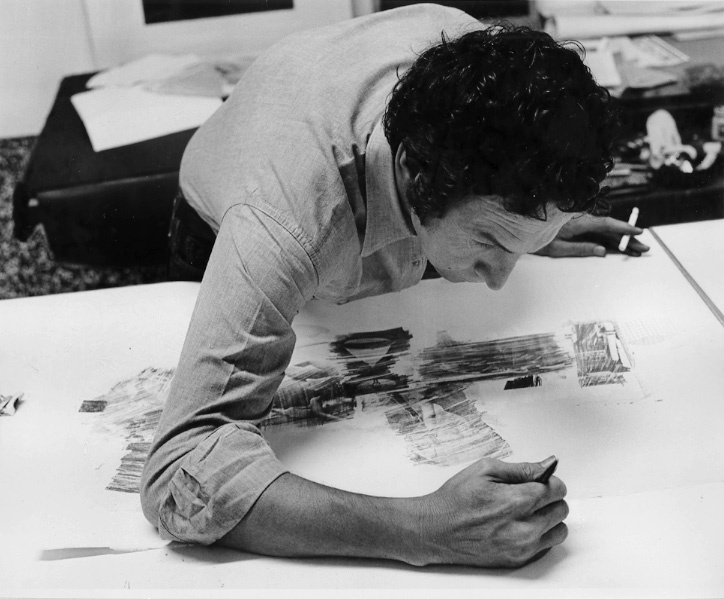 Hiccups strongly suggests a material correspondence with several series Rauschenberg initiated in the mid- and late 1970s that incorporated special craft paper and fabric, most notably Bones and Unions (both 1975) and Jammers (1975–76). 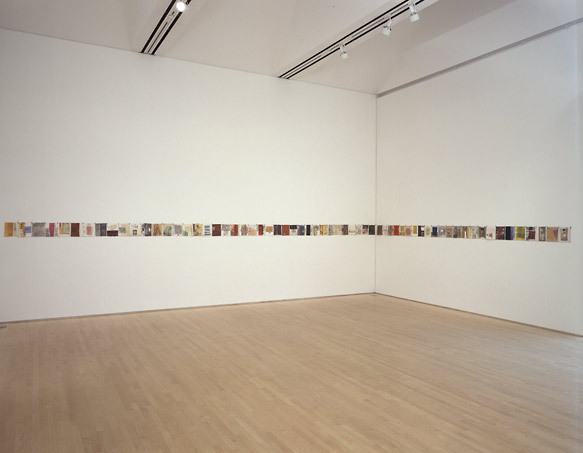 The ambitious visual vocabulary of Hiccups has more in common with the Spread series (1975–83), a set of ninety-five distinct compositions, each consisting of several large collaged panels, and more generally signals Rauschenberg’s return in the second half of the decade to producing artworks grounded in photographic imagery. See William Zimmer’s observation that, in the wake of series such as Bones, Unions, and Jammers, “Rauschenberg has put everything in again.” William Zimmer, “Robert Rauschenberg,” Arts Magazine 52 (September 1977): 33. Although all ninety-seven panels must be exhibited each time the work is shown, the artist allowed for the installation of the panels in parallel horizontal lines when space is limited. For more on this construct see Hal Foster, “An Archival Impulse,” October 110 (Fall 2004): 3–22. Rauschenberg’s strategies may also be understood through the critical examinations of archival practices outlined in two other texts, both of which variously address modernist, postmodernist, and contemporary artistic interventions into (and representations of) archive structures. See Rosalind Krauss, “Perpetual Inventory,” in Robert Rauschenberg: A Retrospective, ed. Walter Hopps and Susan Davidson (New York: Solomon R. Guggenheim Museum, 1997), 206–23; and Benjamin H. D. Buchloh, “Gerhard Richter’s Atlas: The Anomic Archive,” October 88 (Spring 1999): 117–45. See Matthew Rampley, The Remembrance of Things Past: On Aby M. Warburg and Walter Benjamin (Wiesbaden: Otto Harrassowitz, 2000), 58. Warburg also increased the size of various images (e.g., those of small coins and reliefs) to consider their detail in relation to far larger objects (e.g., sculptural reliefs on cathedrals). For more on the Passagen-Werk see Susan Buck-Morss, The Dialectics of Seeing: Walter Benjamin and the Arcades Project (Cambridge, MA: MIT Press, 1991). For more on Warburg’s understanding of the Atlas (and Benjamin’s relationship to Warburg), see Matthew Rampley’s excellent presentation “Benjamin’s Warburg: On the Influence of Walter Benjamin on Aby Warburg” (lecture presented at the Warburg, Benjamin and Kulturwissenschaft Conference, Warburg Institute, University of London, School of Advanced Study, June 14–15, 2012), accessed May 20, 2013, https://www.youtube.com/watch?v=X719QWghqi4. See Buck-Morss, The Dialectics of Seeing, 66–68. Walter Benjamin, Das Passagen-Werk, quoted in Buck-Morss, The Dialectics of Seeing, 67. Benjamin, Das Passagen-Werk, quoted in Buck-Morss, The Dialectics of Seeing, 74. Brian O’Doherty, “Rauschenberg and the Vernacular Glance,” Art in America 61 (September 1973): 82–87. In her review of Rauschenberg’s archival strategies, Rosalind Krauss cites the artist’s 1963 Random Order as a kind of compass for discerning between his prior and subsequent engagements with photography, to be henceforth understood not merely as a consistent source of inspiration for his compositions but as the basis for his understanding of a relationship to pictorial media itself—in essence, the artist’s declaration of a new “photographic” medium. She specifically engages with the process that directly informed the construction of Hiccups (as well as countless silkscreens and prints). See Krauss, “Perpetual Inventory,” 206–23. Warburg’s and Benjamin’s projects posited a specific relationship between the present and past, although it is important to emphasize that neither was merely fetishizing a bygone era: the Passagen-Werk, in particular, was as much about looking at the present and into the future as it was a kind of excavation. In his concluding remarks, Hal Foster addresses this past/present juxtaposition, emphasizing sites of “construction” rather than sites of “excavation.” See Foster, “An Archival Impulse,” 22. See Rauschenberg’s comments in Lawrence Alloway, Marcel Duchamp, et al., “The Art of Assemblage: A Symposium” (1961), in Essays on Assemblage, ed. James Leggio and Helen M. Franc, Studies in Modern Art, vol. 2 (New York: Museum of Modern Art, 1992), 148. Also see note 14 below. In describing the artist’s Automobile Tire Print (1953), Rosalind Krauss anticipates the linearity and extendable logic of Hiccups in 1974, noting Rauschenberg’s finding of “an operational means of producing extension—of accounting procedurally for the way that one piece of the art space relates to the next.” See Rosalind Krauss, “Rauschenberg and the Materialized Image,” Artforum 13, no. 4 (December 1974): 43. Rauschenberg’s participation in the 1961 Art of Assemblage symposium forms the basis for Branden W. Joseph’s incisive discussion of the artist in relation to both the historical avant-garde and neo-avant-garde. See Branden W. Joseph, Random Order: Robert Rauschenberg and the Neo-Avant-Garde (Cambridge, MA: MIT Press, 2003), in particular, “Introduction: The Art of Assemblage,” 1–23, and chapter 3, “Mole Archaeology,” 137–39. 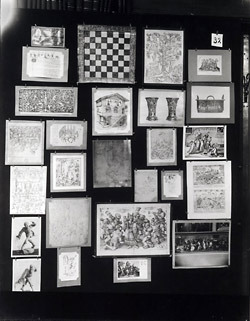 In his discussion of Gerhard Richter’s archive-oriented practice (cited above in note 3), Benjamin H. D. Buchloh carefully distinguishes between Warburg’s and Benjamin’s projects, as well as those of the Russian and Soviet avant-garde and of contemporaneous photomontage experiments in Germany (John Heartfield) and the French Surrealist movement. See Buchloh, “Gerhard Richter’s Atlas,” 117–45. Cage was particularly influential. References to Cage’s use of silence or sounds as structural elements, to be understood not as breaks but as equally integral to the composition, are found throughout his lectures and writings. See John Cage, Silence: Lectures and Writings by John Cage (Middletown, CT: Wesleyan University Press, 1961), in particular “Composition as Process: I. Changes,” 18–34. John Cage, “On Robert Rauschenberg, Artist, and His Work,” in Silence, 98–108. Cite as: James Merle Thomas, “Hiccups“, Rauschenberg Research Project, July 2013. Cite as: James Merle Thomas, “Hiccups,” Rauschenberg Research Project, July 2013.